The City-sponsored Downtown Hotel & Conference Center (DH&CC) on which some $84 million is proposed to be spent has been valued by City financial consultant MuniCap at $29.1m. That number is shown at the end of a couple of pages of calculations of Tax Increment Financing done in September 2014. The valuation is provided in tables without any explanatory text, although there are helpful footnotes. The first sheet, Schedule VI of the MuniCap report lists the hotel rooms at 207 and gives them a unit value of $118,527/room for a total value of $24.54 million. They involve 135,000 square feet (sf) at $182/sf. The table assigns no separate value or $0 to 24,800sf of the conference center. Its value apparently is included in the room valuations. In addition to the $24.54m for the hotel and conference center the associated 15,000sf of retail space is valued at $156/sf or $2.34m and 104 parking spaces are valued at $21,807 per space for a total of $2.27m. Grand total value of the DH&CC complex is $29.14m. The hotel rooms and retail space are valued two ways in another table, Schedule VII of the MuniCap report. A ‘comparables’ estimate of $90,853/room or $150/sf is presented first. That is derived from a list of eight Frederick hotels and the rooms and valuation of each, Schedule VIII. Their per room value ranges between the Hampton Inn & Suite Fort Detrick at $38.9k at the low end and the Hilton Garden Inn at $143.3k at the high end, for a weighted average of the eight of $90.9k/room valuation. The higher valuation of $118,527/room at the downtown hotel is derived from the second valuation method, ‘income capitalization’ detailed in Schedule IX-A. With this method $170 per room per day is the assumed room charge. With year-round occupancy at 66% the hotel grosses $40,953/room/year. Expenses are assumed to run at 72.5% of revenue, a percentage calculated by the state Department of Assessments and Taxation as the average for Frederick County hotels. So ‘comparables’ sneak back as a factor since the consultant does not attempt any income forecast as such for the DH&CC. 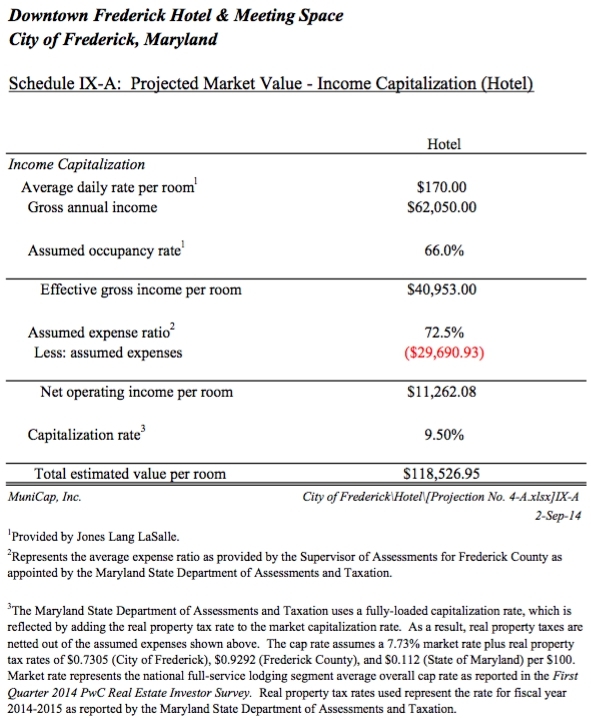 That ‘capitalization’ procedure of projecting income merely from room rate and average occupancy and applying average cost/gross income leaves net operating income per room at $11,262 a year. A capitalization rate of 9.5% is applied to that $11.3k annual net income/room in order to get the $118,527 valuation per room. The 9.5% is derived from a market capitalization rate of 7.73% to which is added 1.77% for city, county and state property tax rates. The $118.5k valuation per room with 207 rooms multiplies to $24.54 million valuation for the hotel and CC less the retail and parking. The retail component of the project — 15k sf to be located apparently in the old Trolley building — is valued at $156/sf by the comparable method and $179/sf by net income capitalization method. The lower ‘comparables’ result is used to obtain the $2.37m valuation. If the higher income capitalization method (Schedule IX-B MuniCap report) had been applied the value of retail would have been $2.69m making the total DH&CC valuation $29.46m, a small increase on the $29.14m arrived at by MuniCap. Comparable retailing space in this case consists of four suburban shopping centers where the market value per square foot varies between $125 at Westview Corner to $206/sf at the White Star Shoppes, Spectrum Drive. It seems an odd comparison set for a downtown valuation. that the so-called ‘comparables’ are not really very comparable. A downtown hotel provides a different setting, and the proposed hotel as ‘upscale’ is priced to attract bigger spending guests than the more suburban style hotels off the interstates. Potentially it can make more money and deserves a higher valuation. So it isn’t unreasonable, as MuniCap did, to go with a valuation method that provides a 30% premium (118.5/90.9) on the average of the ‘comparable’ hotels provided by the capitalization method. Of course there is no guarantee the downtown hotel can attract the $170/room rate, a substantial premium on the $75 to $150 rates the existing hotels typically get. The valuations done by MuniCap were done in 2014 so we need to bring the values up to 2016 levels. Commercial property has increased about 6%/year in the last couple of years, so it makes sense to adjust the 2014 values by 12%. The $29.14m valuation given to the project by MuniCap then becomes $32.6m. $29m then, $33m now. For a project costing $84m any number derived from the MuniCap valuations makes it look like one very wasteful, overbuilt, gold-plated project undeserving of taxpayer support. One heck of a boondoggle! NOTE: MuniCap, Inc. is, in its own words, a public finance consulting firm based in Columbia, Maryland that specializes in the public finance aspects of redevelopment. MuniCap also has offices in Dallas TX, Charleston SC and Richmond VA. ADDITION: The land for the project has been costed at $3.55m. MuniCap made no allowance for land in their valuations of the project, so it was a valuation of ‘improvements’ to the land. Since land purchase is included in the $84m, the proposed cost of improvements is a bit over $80m. So the $29m valuation of the project in 2014 and $32m in 2016 prices is best compared to the $80m official estimated expenditure.